The history of the Williamson County Public Library and its presence in Franklin dates back to the 1920’s. It began with a few books donated to the local American Legion in Franklin, in the Masonic Hall on 2nd Avenue in downtown. 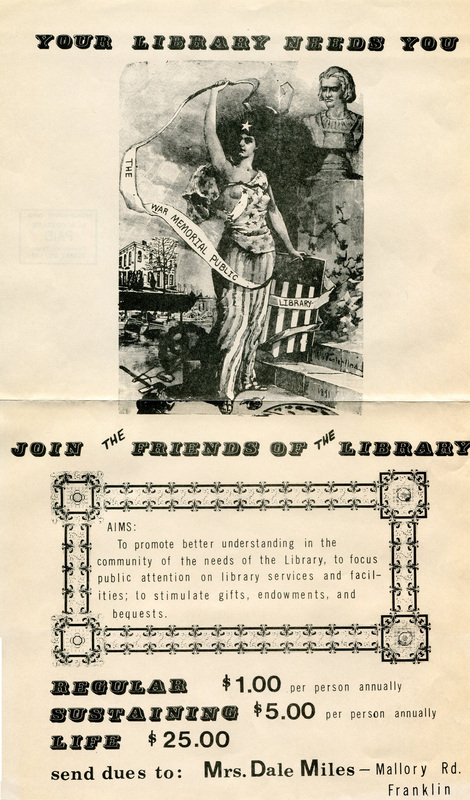 By 1936, the Legion and the Professional Women’s Club raised enough money to have a one year experiment full time library, which opened on June 26, 1936 in the back of the old Post Hotel on the public square. The “experiment” was so successful that within 6 months it was decided to have a permanent library in Franklin, and the Williamson County Public Library was born. By 1938, the library was able to hire its first full time librarian, and in 1939, needing more space, the library moved to the Old Bank Building on the west side of the Public Square. With World War II came a change of name, and the Library became the War Memorial Public Library. By 1949, the library had again outgrown its space, and moved to the German House on Fifth Avenue and Fair Street. The library became part of the regional library system in the 1960’s, and in the 70’s began opening braches – at Fairview and Brentwood. By the late 1970’s the library had once again outgrown it space, and a new facility was built at Five Points on the site where the Franklin Elementary School had burned in 1962. In the 1990’s the library became a County institution and the name was changed back to the Williamson County Public Library – but had once again outgrown its space by 2000. In 2003, the Library moved to its current home on Columbia Ave.